My friend Amy and I were finally able to shop at the co-op now that Irene was well in our past and the checkout line wasn’t snaking out the door. We had plans to make dinner together Friday evening but were unsure what to make. In the produce aisle Amy suggested an Indian curry. We had come for spices anyway so it seemed like a good idea. Armed with Madhur Jaffrey’s Quick and Easy Indian Cooking, we decided on a variation of her Masoor Dal, or Red LentilTarka. Tarka refers to cooking spices briefly in hot oil, to bring out their flavors. The lentils cook down to a creamy, luscious consistency and the garam masala and dried red chiles bring the heat. In addition to the red lentils, we had an armful of local eggplants and long thin okra. Feeling bold we decided to improvise an okra-eggplant curry. We sautéed a chopped onion in two tbsp of ghee then added about 4 c of chopped eggplant. After the eggplant was soft (maybe 10 minutes) we added chopped okra, a large pinch of garam masala and salt, and 3-4 c of chicken stock. We let that simmer down for a half hour or so, until thick, and served in addition to the red lentils. Clean the lentils well and discard any small pebbles. Place the lentils in a three-quart pot with 4 c of water or stock and bring to a boil. Add the ginger and turmeric, turn the heat to low and cover leaving the lid slightly ajar. Cook for 20-25 minutes. Approx. 10 minutes before your lentils are done, if you are using onions and garlic, heat approx. 2 tbsp of ghee or vegetable oil in a medium skillet. Add the onions and cook for 5-10 minutes, then add the garlic and tomatoes (optional, but they’re so good this time of year why not?) and cook for a couple more minutes. 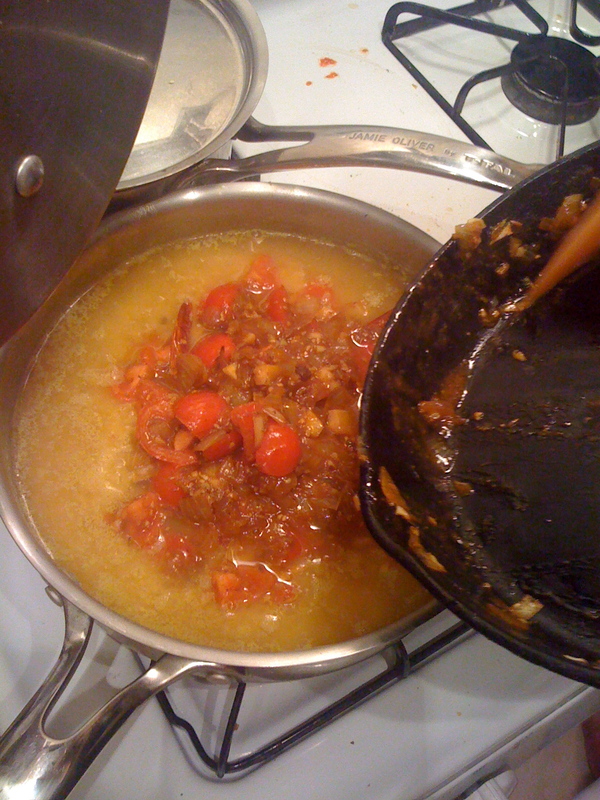 Transfer the onion mixture from the skillet to the lentils, leaving the oil in your skillet. Add an additional 2 tbsp of ghee or oil to the skillet and heat on medium. 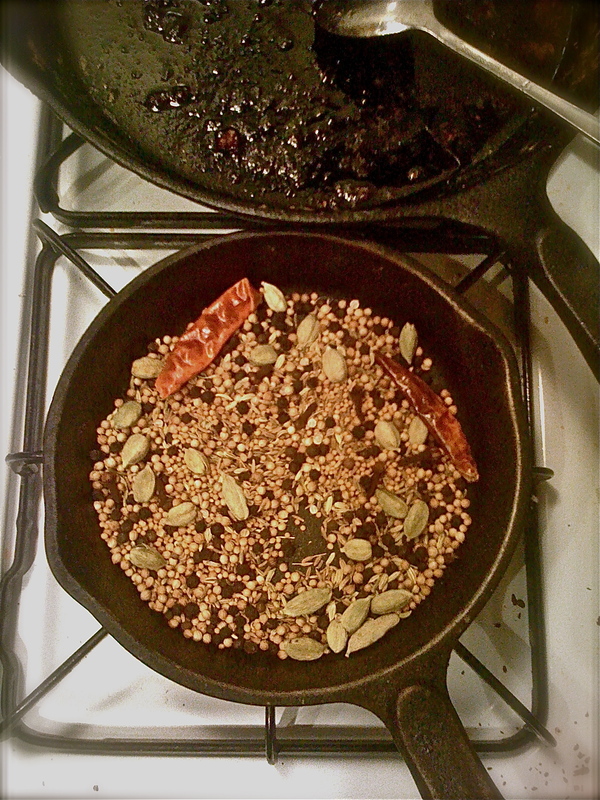 When hot, add the garam masala, cumin seeds, and red hot peppers and cook for approx. 10 seconds. Quickly add the spice mixture to the lentils and cover with a lid. Let all the ingredients simmer together for another few minutes before serving. If the dal seems too liquidy at this point you can simmer for longer, uncovered, to let some of the liquid evaporate. Add the salt and season to your liking. Serve with basmati rice and thick yogurt, raita, or pickled vegetables or chutneys.